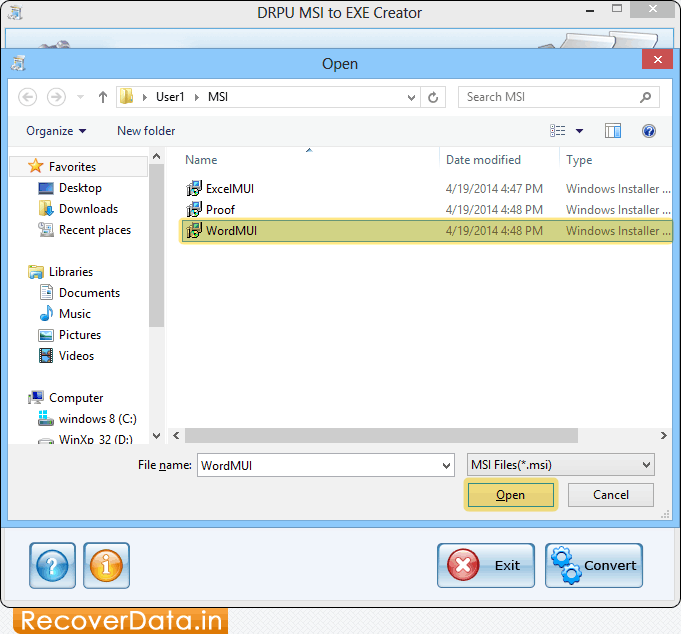 MSI to EXE Creator is a setup builder tool to create exe (executable file) files from Windows installer (MSI) files. MSI to EXE Creator Software generates and builds executable (.exe) setup files by using original Microsoft installation (.msi) files format. EXE Setup Creator program creates similar executable file from Windows installer MSI package. Software converts .msi extension file to .exe file format setup installer and provide wizard like easy interface facility to save converted exe setup at any user specified location. Setup Creator creates EXE format installer Executable file from MSI setup file to release your software products in standard EXE installer setup format. Setup Maker tool supports Windows 98, 2000, 2003, XP, ME, NT and VISTA Editions. Convert .NET framework MSI installer setup package file to EXE format installer setup package file using existing MSI file format. Setup builder is capable of converting MSI windows installer setup format file into equivalent exe installer format without compromising the originality of your MSI application. Generate EXE setup installation package from MSI installer files. MSI to EXE Creator tool converts Microsoft Windows installer files into executable installer file format. Software enables users to save created exe file at user specified location. EXE Setup Maker tool generates installer package setup from MSI as well as other windows MSI installer files created using any third party compiler. Does not require any technical skills to operate the software.